Millions of effulgent bands of light danced in front of his eyes. Every colour in the spectrum was there, outstanding against the pitch-black background. He willed one forward and ran his fingers through it, then reached out to another simultaneously. With a shock, he bent the threads into a single format, the colours turning a subtle yellow for a second at the disturbance. From the corner of his eye, he detected a small, dark purple strand, and willed himself towards it. He inspected it, ran his fingers through the light and decided to detour it into a dead end. Immediately, three others lunged at him, a glaring red. He quickly bent them together into a single stream, shooing the communications signal into the endless void with a slight wave of his hand. “Try to find that,” he dared with defiant satisfaction. Outside of the capsule, the hum of the fluid routers gently permeated the otherwise silent relay tower. Housing countless routers, the tower was one of the main backbones of the FTL-communications network owned by several providers and supervised by CONCORD. It was a dark, foreboding complex in the middle of nowhere, closer to Yulai than any other system - though that hardly mattered, considering the distance between them. There were very few incidents that night. Things went rather smoothly compared to other nights that he had experienced. The specks of colour could literally leap to him. Fast thinking was required, but luckily the implants enhanced his processing speeds to extreme levels. He was a part of the CRC. Fitted with implants much like the piloting implants used by new academy graduates to pilot their ships, his world was one of ever-changing hues. The devices inserted into his occipital lobe ensured each channel was represented as a spectrum of colours, shot through with tiny incandescent motes of information. The visualisations made it far easier for the brain to process the torrents coursing through the fluid routers. He mused to himself that he couldn’t imagine what it was like to process all this information the old-fashioned way, then plucked a hair-thin strand of green and merged it into a larger existing strand. When CONCORD assumed jurisdiction over the FTL-networks, they saw that something was needed to vastly improve methods to regulate the information and, thus, the Communication Relay Commission was called into existence. Methods were devised to allow them to survey large quantities of information. Perfection was found in the capsule technology the Jovians had introduced to the galaxy. Fitted with highly advanced augmentations, the CRC patrols the backbones of the fluid router relays, scanning the communications for breaches and keeping the official CONCORD channels clean and safe of disruptive influences. The capsule slid open. 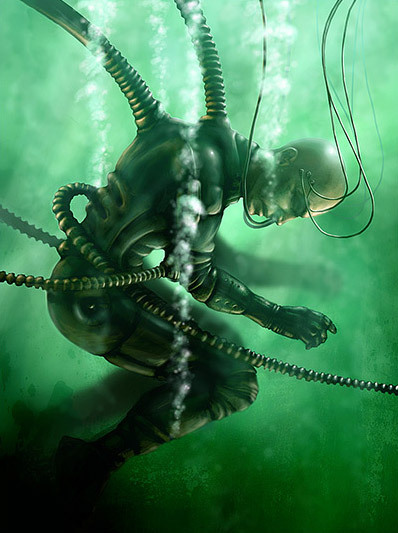 The neural connectors retracted themselves and he made his way out. Already, someone was waiting with towels and hot Arkonian tea, both of which he gladly accepted. The darkness inside the relay tower seemed almost intentional and the hum was louder now he was outside of the pod. Shadows cast across the router complexes while a glaring blue light paled in contrast to the world that waited in the pod. Damn, he did love his job. He couldn’t wait to get back.